Recently surfaced video shows two New York City police officers apparently taunting students from a Brooklyn high school, threatening them with a Taser as they walk down the street. 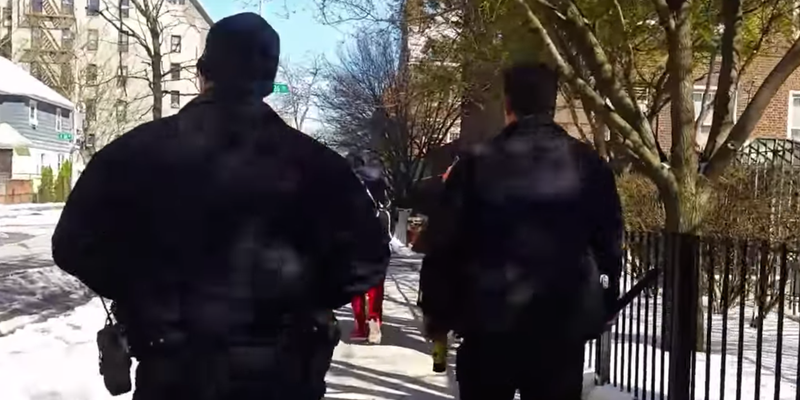 The video, recorded in mid-March, appears to show one officer with his baton out in his hand as he and his partner walk down the street, apparently trying to shoo students from Midwood High School off the sidewalk, The Gothamist reports. As the students cross the street, the officer taunts, “You better walk away,” before he stops following them. Vitale told The Gothamist that he began recording the incident after seeing the NYPD officer get out of his vehicle with his baton already drawn. Vitale acknowledged that he was not privy to what happened before he witnessed that particular interaction, but added that when the officers approached the students, nothing was happening. “I see officers aggressively dispersing students from Midwood all the time,” Vitale said. “Sometimes, admittedly, there are fights after school, and school safety officers, who are unarmed, will get the kids to move on. Read more at The Gothamist.